Headlining the collection are A Valley Without Wind and its sequel A Valley Without Wind 2, both of which we reviewed, and both of which we thought were pretty darn awesome. The zombie survival game Shattered Haven has only been out a few months but there it is, sitting right alongside the others. Tidalis is Arcen's most unusual title in that it's a puzzle game with lots of pastel colors. No zombies or evil overlords poisoning farmlands, but it's fun, and it's got co-op! And finally, AI War is out in spades in the bundle, and you can nab six expansions including the brand new Vengeance of the Machine. 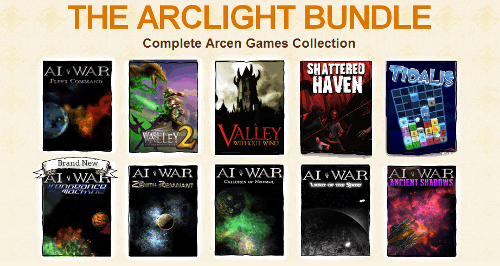 The Arclight Bundle features a "pay what you want as long as it's above the minimum" model where you can spend as much or as little as you like. Beat the minimum and you'll knock down the price for the next buyers. All games are available for PC and Mac and come with direct downloads, Steam keys or Desura keys. Now it'll be easy to distract yourself from E3! Page created in 0.8040 seconds.